Yep, this means that I finally got one. It has been nearly 4 full months since the last update and our loyal followers must be beside themselves with wonder over what has been going on in our lives. What’s that? What loyal followers? All right, point taken, but still, someone out there must be wondering because I take occasional grief for going so long between posts. We have been in the marina at La Paz since last November and life is pretty much like it was living aboard in Alameda. Pretty much like day to day living in a very tiny house or small apartment anywhere. Still, I guess stuff does happen, like the Blue Heron who marched up and down on our finger pier or the times (twice) that I dove to clear a plastic bag that had been ingested by seawater intake of our air conditioning unit. 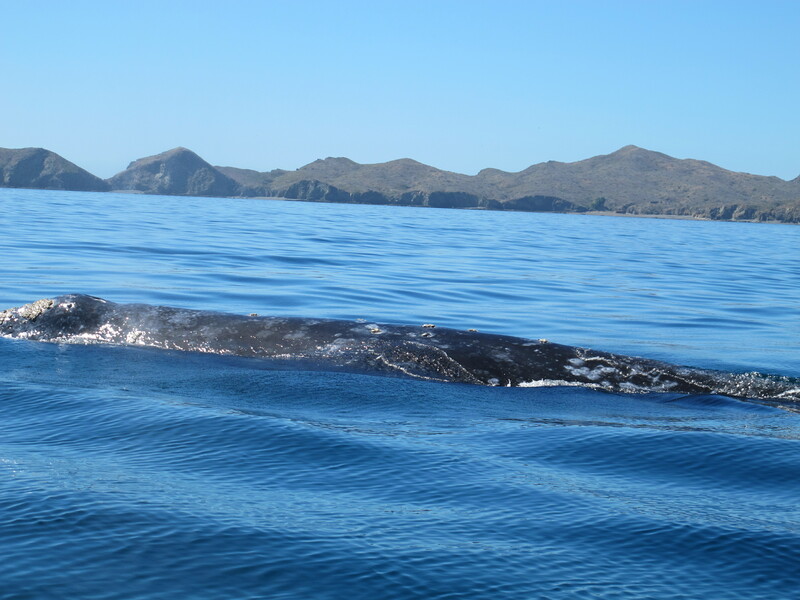 So here goes…..
whales go there to calve and when the calves reach a certain age the mothers herd them out into the bay and there they make themselves very available to humans. It is not uncommon for them to stay beside a boat for some time while allowing themselves to be touched and, of course, photographed unmercifully. Unfortunately for us, we arrived too early for the real show. While the calving had already taken place, the calves were still hanging out in the shallow waters around the mangroves. Two or three weeks would make all the difference. Still, we had a great time. 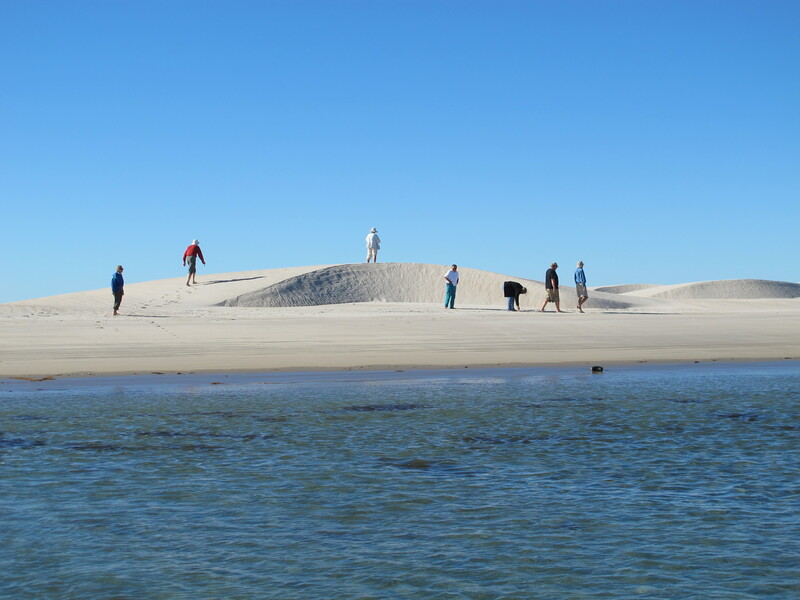 We did get to see a few whales but mostly we had a fun little adventure with some friends. Maybe next time we’ll get the up close and personal whale experience. Judy made a couple of trips to PHX to see the Chiropractor regarding her back pain over the past couple of months. I stayed home each time and puttered around doing projects. Judy sees a practitioner of the Palmer/Blair technique of upper cervical chiropractic and has seen measurable improvement. Most notably, she has been able to get off of the very strong medications the conventional Doctors had her on. That alone improved her quality of life but she also hurts less. She still has activity limitations compared to before her injury but nothing that gets in the way too much. Standing for very long gets to hurting but so long as she can sit down for a bit she’s OK. The same for walking, she can’t go more than about 15 minutes before she has to sit for a bit. Once we are out cruising those limitations don’t matter very much and the opportunity for her to swim several times a day is really helpful. In any case, she is able to move around the boat and in and out of the dinghy without restrictions. In April there is a week long cruiser event in La Paz called Bay Fest. There are seminars and all kinds of raffles and tournaments. Dominos, Baja Rummy, Cribbage, Bridge, Volleyball and Beach Bocce ball. Judy ran the Mexican Train Dominos contest and competed in Baja Rummy. She did pretty good with the Rummy but the only spot receiving recognition is first place and she did not do quite that well. 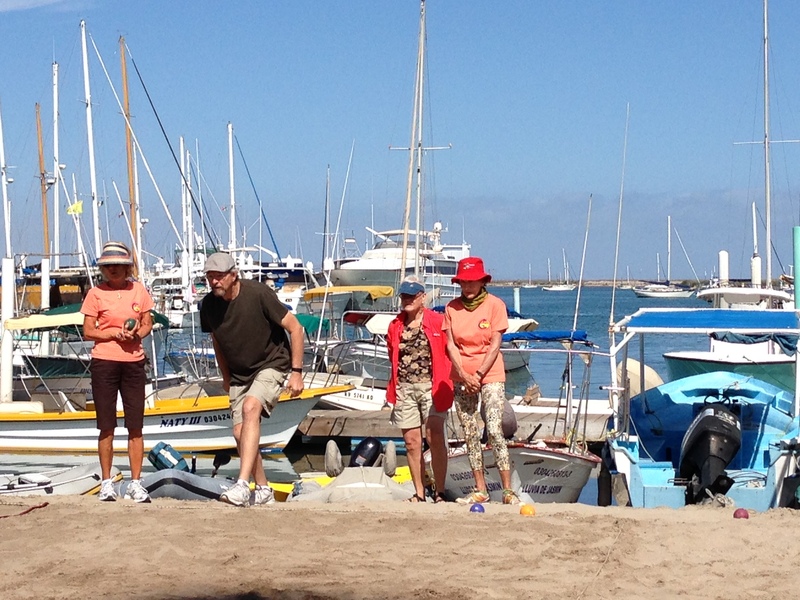 I had a go at Bocce Ball, joining my partner from the last competition – we were promptly eliminated that time. This time however, we did much better. In a field of some 50-odd teams we made it into the “sweet 16” before meeting our fate. I’ve also been working to improve my meager Spanish. I’ve had a tutor come to the boat 3 times a week since March. You might think that my Spanish would be pretty good by now but, while she is brilliant, apparently I am not. Still, I think I have learned a few things and hope to keep progressing over time. May 2nd we began driving North. We needed to store the car someplace as we will not be needing it for a long while plus we needed to supervise another health insurance switchover. And so began another whirlwind trip. Dash to the Bay Area for the insurance thing, get well baby check ups while there, see Randy and family then dash off for PHX. In PHX Judy gets to see the Chiropracter, daily if needed, and we check in on Chip’s family and the other grand kids (Randy’s). A bit of shopping for things to take back south with us then park the car with friends (Wally & Kristy Lawrence) in Flagstaff then it’s hop on a plane for La Paz. That flight should take us home on Sunday the 25th – Memorial Day weekend. That adds up to 3 weeks and a couple of days but it sure goes faster than that. That seems to me to be a long enough time to be away from your home but there never is enough time to see everyone we would like to see. And those few we do get to see must be brief visits. We hold out hope that next time will be different but, at least so far, it is always the same. What will we most likely do next? This is sort of like a plan but less specific or certain than a real plan, maybe more like an intention rather than a plan. Whatever we should call it, it is merely an outline and very subject to considerable change. We should be able to get Milagro underway about the 1st of June and head north into the Sea of Cortez. We will spend the majority of the summer cruising the Baja coast and islands maybe as far north as the Bay of Los Angeles (Google earth can show you where that is). We haven’t been that far north and would like to see it. In any case, we will be in San Carlos on the Mainland side near Guaymas to haul Milagro on August 29th. She will rest in dry storage there while we fly to Barcelona, Spain and board a cruise ship to cross the Atlantic. That cruise will end in Puerto Rico where we will play tourist for a few days before flying back to PHX. I think we will probably stick around PHX long enough to sell our car (know anyone who would be interested in a 2001 Ford Explorer?) before splashing Milagro and resuming cruising the SOC. The general thought is that we will work our way south from there and spend winter (2014/15) on the Mainland coast. How far south? We don’t know yet, but Barra de Navidad for sure and maybe as far south at Ixtapa/Zihuatanejo. We’ll see. That’s more than enough words for now so I’ll end this, this….uh, whatever it is. Thanks for tuning in and, as always, I swear I’ll do a better job of keeping this up going forward. Maybe even with pictures. Yeah, I know, you’ve heard that before, haven’t you? But, hey, it could happen. Thanks for catching us up and love the “plan”. Sounds like you are going to have a wonderful summer and envious of your trip to Spain and cruise. Looking forward to seeing the pictures. Glad Judy continues to improve. Miss you two!